Claims For Medical Help With Opioid Abuse Jump Sharply : Shots - Health News Insurance claims for medical services related to opioid dependence rose more than 3,000 percent between 2007 and 2014, a study finds, suggesting that opioid problems have gone mainstream. Prescribing of oxycodone and other opioid pain pills rose sharply after 2000. 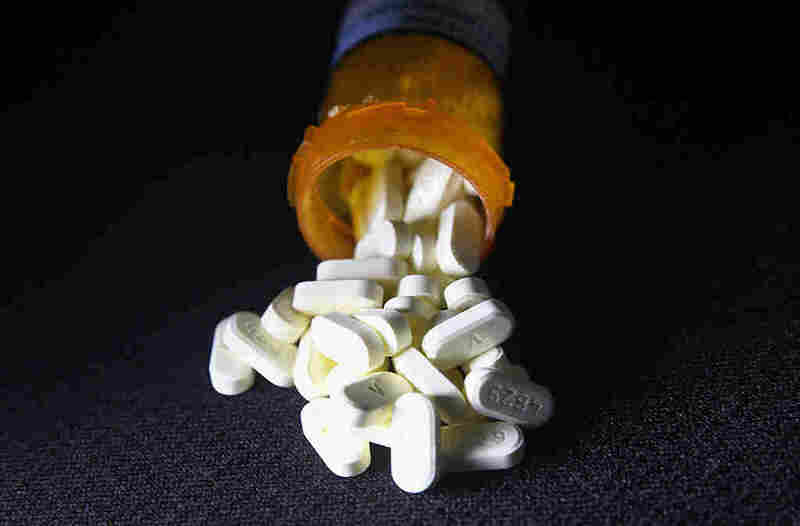 Health care claims for people with opioid dependence diagnoses rose more than 3,000 percent between 2007 and 2014, according to an analysis of insurance records. The findings illustrate that the opioid problem is "in the general mainstream," says Robin Gelburd, president of Fair Health, a nonprofit that analyzes health care costs and conducted the study. The researchers used de-identified claims data from insurers representing 150 million patients who either have insurance through work or buy coverage on their own. They looked for diagnosis codes related to opioid dependency and abuse, adverse effects of heroin use or problems caused by the misuse or abuse of other types of opiates, including prescription drugs. They found that health care costs related to opioid dependence increased most sharply since 2011, a period marked by increased attention to the problem and a growing pressure on physicians to reduce the number of opioid prescriptions. Younger patients ages 19 to 35 were most likely to be diagnosed as opioid dependent. Dependence is defined by symptoms such as increased tolerance, withdrawal or unsuccessful attempts to quit. Those younger patients were also more likely than older ones to overdose on heroin. The reverse was true for overdoses related to other types of opioids, which were more common in people in their mid-40s to mid-50s. The number of medical services such as office visits and lab tests for patients with a dependency diagnosis rose from about 217,000 in 2007 to about 7 million in 2014. "A 3,000 percent increase is enormous," says Andrew Kolodny, senior scientist at the Heller School for Social Policy and Management at Brandeis University. He did not work on the study. Such a sharp rise over a short period of time is a classic definition of an epidemic, Kolodny says, and one that points out that much more effort is needed to prevent future cases and treat people who already have addiction problems. Still, basing an analysis solely on insurance claims data, while common, may not paint a complete picture. The accuracy of billing codes may be poor, for example. In this case, increased attention to the opioid problem may have also resulted in an increased use of related codes. Some research studies also pair claims data with medical record information, which includes doctors' notes. This study did not. Across all age groups, men were more likely than women to be diagnosed with dependency. That gap narrowed among patients in their 40s and 50s, with women representing 45 percent of those diagnosed. Women were more likely than men to overdose. The ratio of opioid dependence to other substance abuse problems varied by state. Rhode Island had the highest ratio of opioid problems, while Maine and Montana had the lowest. Kolodny is among those who say that the increase in addiction is directly tied to the run-up in opioids prescribed by doctors in the past decade. Some of those who develop dependency problems are the patients who get the prescriptions. But many also obtain the drugs illicitly, from a friend, family member or dealer. Younger people, says Kolodny, may start with prescription medications but then turn to street drugs like heroin because they have "a harder time maintaining their opioid supply by visiting doctors." Older patients, he says, are less likely to turn to street drugs because they have an easier time getting refills from their doctors. Data from IMS Health, which tracks prescription drug sales, shows the number of prescriptions for opioid-based drugs have ticked down, falling 11.8 percent from 2012 to 2015. That decline, however, followed a huge increase: The number of opioid prescriptions more than doubled between 2000 and 2012, when more than 282 million prescriptions were written. In 2014, federal health officials reclassified certain drugs containing the opioid hydrocodone, including Vicodin, making refills harder to get. In addition, many states have begun prescription monitoring programs, which aim to identify and track people who are "doctor shopping" in order to get multiple prescriptions for narcotics. Pharmacists or physicians can check those databases to see if a patient already has a prescription for narcotics before dispensing another. In 2001, only 16 states had laws allowing monitoring programs. By 2012, 41 states were operating one, according to a report by the Pew Charitable Trusts. "There's some evidence that those are helpful in reducing prescribing," says Allan Coukell, senior director for health programs at Pew. But he added that treatment options are still lacking. "The reality is, even in states that have done that, demand is far in excess of what they can provide." In mid-July, President Obama signed the Comprehensive Addition and Recovery Act of 2016, which aims to make prevention and treatment more widely available. Supporters say the legislation will help, but criticized lawmakers for not including more funding. The data from Fair Health, Coukell says, show the scope of the problem. "What this tells you is this is not limited to a problem of the poor and unemployed," he said. "This is a problem that is cutting right across society."